Somehow we managed to eat and sleep our way through the entire month of December surviving off a not so sustainable diet of eggnog, hot toddy’s and cinnamon rolls. This January we joined the masses in making 2019 a year of healthier habits. We stopped going out as much and started cooking at home, preparing delicious meals and incorporating seasonal fruits and veggies. Last Saturday we went to the Cuesa’s Ferry Plaza Farmer’s Market to pick up some fresh produce. 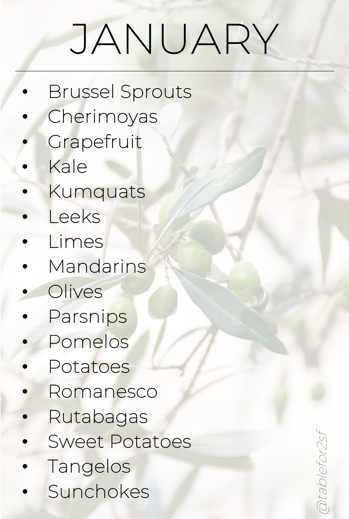 Here’s a list of what’s currently in season with an added fun recipe that’s bound to spice up your salad and cheeseboard. JANUARY’S MUST TRY RECIPE: Pickled Romanesco. Thank you Larder Love for this quick and simple recipe. Wahoo, it’s officially the beginning of fall which means I can bust out my long sweaters and boots and not feel like I’m cheating on summer. It is also means that it’s pumpkin season. Pumpkin cookies, pumpkin spice lattes, pumpkin butter… you get it. They’re inescapable. From cooking to decorating, they’re the perfect fall item. Right now we are planning our October charcuterie plate and went to Cuesa’s Farmer’s Market at the SF Ferry Building for inspiration. We highlighted what’s currently in season. 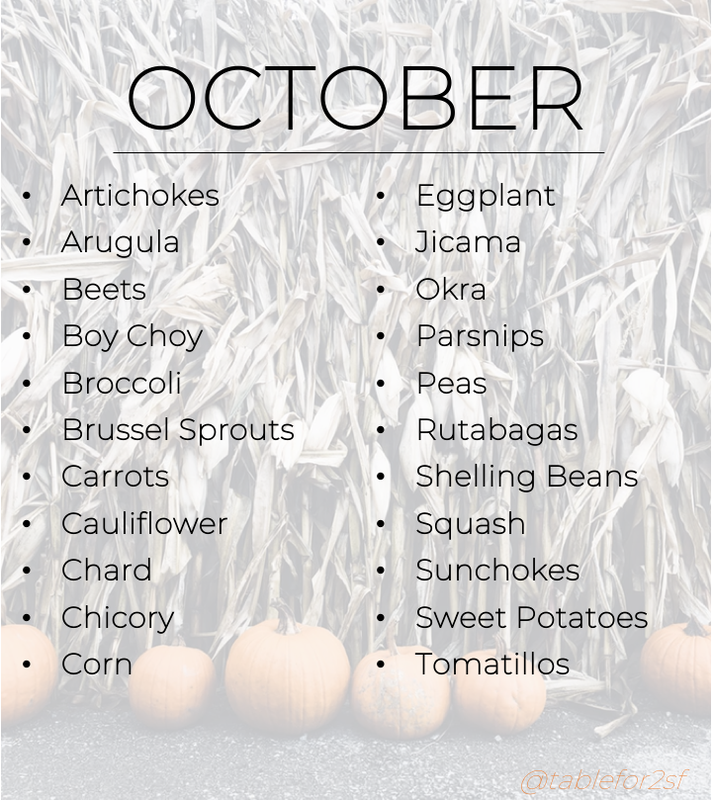 We’ll be getting creative with PUMPKINS, squash and some other fun seasonal fruits and veggies this month. Are we missing anything, what’s on the board for your perfect October charcuterie plate? Wine lovers rejoice, tickets for Barrel Tasting go on sale this month on January 23rd! Save the date, and buy your ticket to one of wine country’s most magical events. And while Barrel Tasting isn’t until March, this will give you plenty of time to plan what’s sure to be, a glorious weekend. Let’s Start Off With - What in the Heck is Barrel Tasting? I’ve already told you that it’s magical, so let me explain why. It all starts with the wristband. You wear it all weekend (unless you go with a one-day ticket) and it opens the door to 50+ wineries in the Dry Creek, Alexander Valley, Napa, Sonoma area. The organizers post a laundry list of participating wineries, and then you get to plan a route and try places you’ve never been to before.When you arrive, you get to sample wine after wine after wine… You can sip on futures, talk to winemakers and get a sense of what you like. So if you’re on the hunt for a new wine club, or looking for your new go-to Pinot, this is one of the best ways to check out lots of new places. How Do I Make My Experience Extraordinary? 1. Put together your wine tasting dream team, with no more than 6 people! This rule kinda stinks and it’s a newer rule that they probably put in place because a bunch of rowdy kids from Sonoma State used to roll up in 30 person party buses, be way too drunk, and cause some ruckus… oops!! They’ve since put a rule in place and some wineries do not allow groups of 8 or more. I think it comes down to the fact that some of the tasting rooms aren’t equipped to handle large groups, but I’m also pretty sure they’re trying to keep the 30 person party buses to a minimum. So before you make your route, review the list of participating wineries and check to see if your itinerary has an wineries that won’t allow big groups. Have a big dream team and can’t leave anyone behind? No worries, just be prepared to get turned away from some wineries and plan for bigger spaces like Family Wineries. 2. Pack FOOD… lunch, snacks and beverages! For the most part you’ll be drinking your lunch. Food isn’t provided and when you’re on Wine Road there are not a ton of places to visit. Pack a big lunch and also include snacks like a cheeseboard, Cheetos, Chips, loaves of bread… Get ready to Instabrag because most spots have picnic tables and we know those vineyards make great backgrounds. Don’t forget to hydrate, the wine will be free flowing. Also, remember that this is a marathon, not a sprint! They’ll have water on-site, but speaking for a friend… a little wine goes a long way, so be sure to stay hydrated between stops. 3. Make a weekend out of it! Your magical wristbands works for 3 days, which means you don’t turn into a pumpkin until 4pm on Sunday. So if you can, try to book an Airbnb and stay up there all weekend long. We try to pick up bands on Friday, do a chartered car all day Saturday, and then in a sightly hungover state, hit up a couple of wineries on the trek back down to San Francisco on Sunday. I’ll be sure to keep you posted on preferred routes once the list of wineries is posted. Would love to hear any of your tips and tricks! When it comes to entertaining guests, throwing together a cheese board is the easiest way to look like you know what you're doing. First off, it's elegant AF, plus it's super easy to assemble. Here are 5 things you should always keep on hand, so you'll be prepared for any last minute invites or in impromptu get-togethers. Dried Fruit — Since fresh fruit has a short life span and you never know when you're going to be invited over, dried fruit is an easy solution. Keep things on hand like dried apricots, cherries and banana chips. And depending on what color serving platter you are using, try to opt for something that will give your plate a pop of color. When we use our Crate and Barrel Tondo platter, we add plantain chips for added color, and use a white bowl to show off the currents. Nuts — Grace your plate with the Queen of the Almonds, aka- the Marcona Almond. These regal sounding treats are really easy to find, you can stock up at Whole Foods, Costco, Trader Joe's and even Amazon. Not an almond fan? No worries, you can use anything from walnuts to peanuts and sprinkle them around the tray, or showcase them in small dishes. Crackers — We live near a Trader Joe's, which means we have endless options for crackers. We tend to keep their Fig & Olive Crips, or Rosemary & Raisin Crisps on hand. They're savory crackers that pair really well with soft and spreadable cheese — like brie or goat cheese. I also LOVE the apricot & ginger Raincoast Crisps. But get creative - there are so many buttery, savory, sweet and gluten free options for you to go with! Something Salty — Achieve cheese board balance by offering something for your savory friends. You can go with olives (which are great to keep on hand for your dirty martini lovers), a tapenade, or anything pickled. Cornichones are also an easy go-to, plus, they're adorable. Something Sweet — For those with a sweet tooth, dried fruit may not be enough. This is where you can add fresh honey, candied nuts, quince paste and jam. All these items are super easy to have on hand or can be picked up at the super market. Plus, they have a decent shelf life, so it's great to stock up around the holidays. Now that we've shared a couple of our favorites, we'd love to hear about your staples! Please share in the comments section below!